Initially I used a rope coming through the base of the mast to hold the mast down but have now switched to a more proper design using a tiller extension clamp. 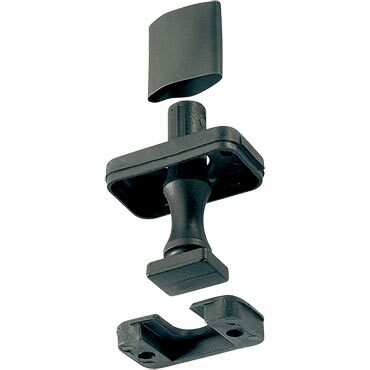 I am using this Ronstan accessory as a flexible mast step, allowing the mast to lay down on the deck and pop back up to its upright position. A lot of the design comes from Mick MacRobb’s Flat Earth Kayak Sails design. For the boom connection for the kayak sail, I first tried just lashing the boom to the mast using a bolt through the end of the boom to secure the line. However, I am experimenting with a sturdier design using stainless steel bimini clamps. The left object will slide onto the mast and allow the boom to swivel around the mast. The right object slides onto the end of the boom then the ball slips into the mast clamp and allows the boom to close all the way to the mast to store on deck. My aunt did all the stitching but first we made a design with Tyvek. 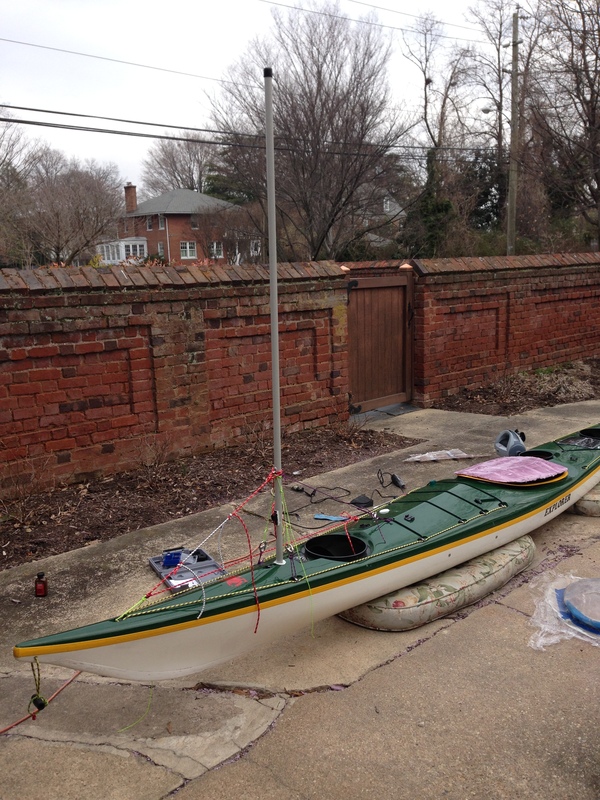 We knew the kayak sail would need three battens with one long batten to extend the sail area. 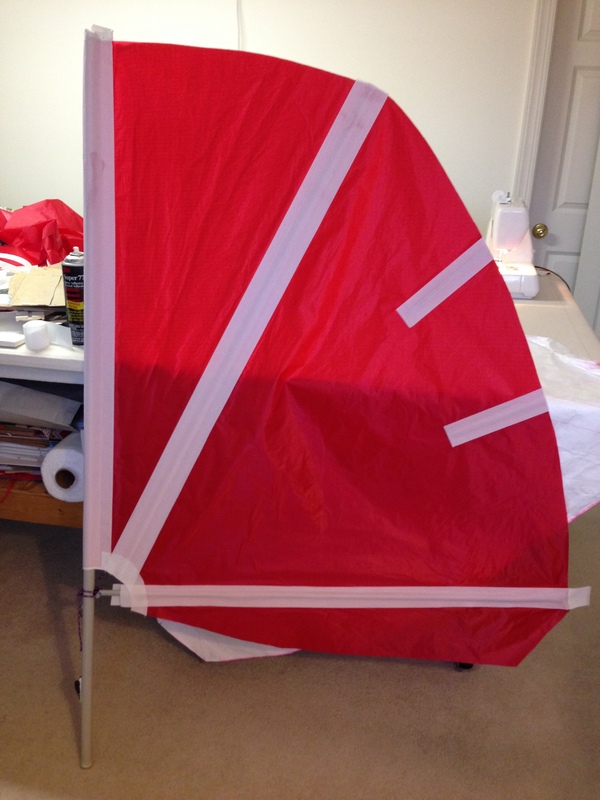 We used .5oz ripstop nylon for the sailcloth, 5oz non-adhesive dacron tape for the edging, and 4oz polyester thread, all ordered from Sailrite. 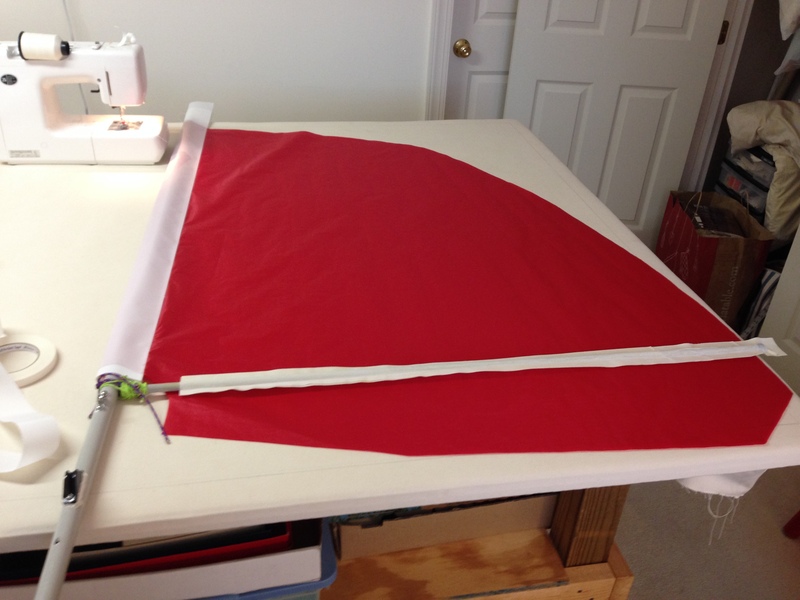 For the mast sleeve we used six inch dacron on both sides of the sailcloth. 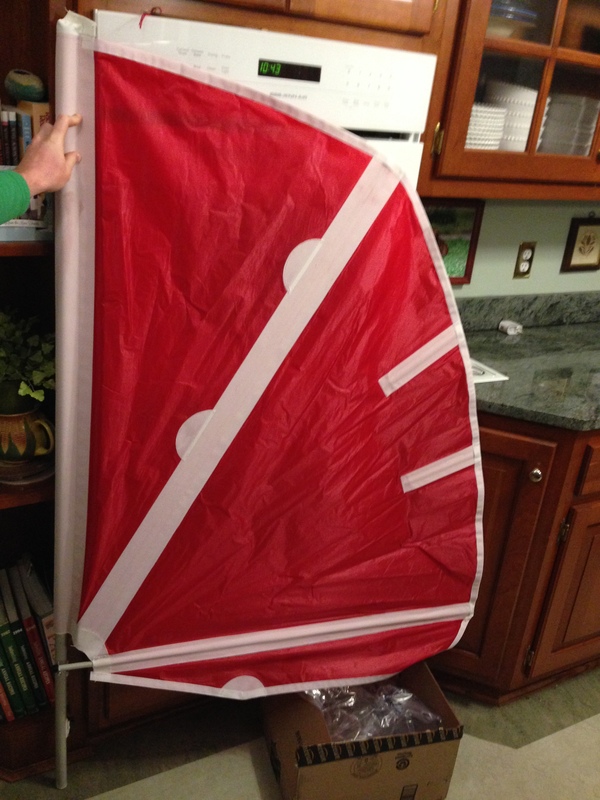 We folded the sailcloth over to make a two-layer sail. We then stitched the two layers of dacron together both at the mast and at the edge to make the mast sleeve. In the picture below you can also see that I glued a layer of two-inch dacron on either side of the boom. I did this so that we could simply stitch the boom into the kayak sail when we got to that point. I did the same for the battens. 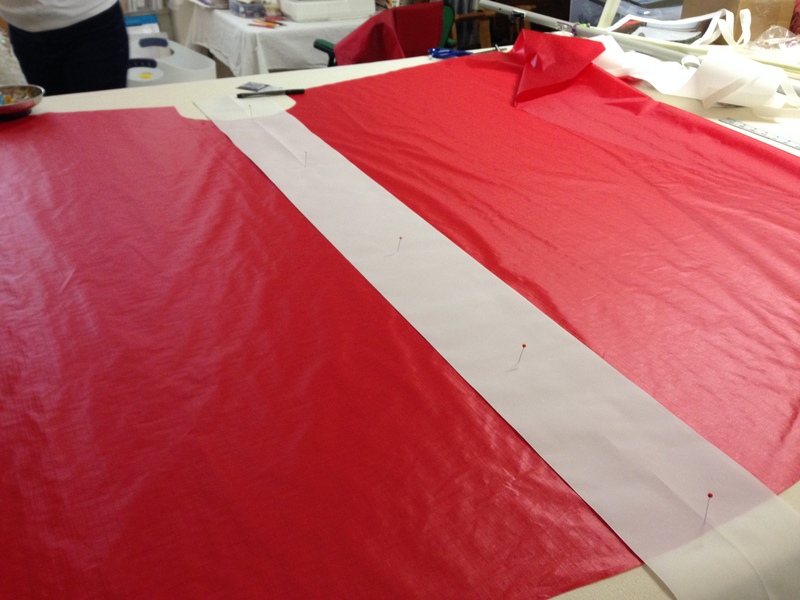 We then used a light layer of spray adhesive to bond the two layers of sailcloth with the battens inside. We then added a layer of three inch dacron on the large batten and two inch on the boom and short battens. 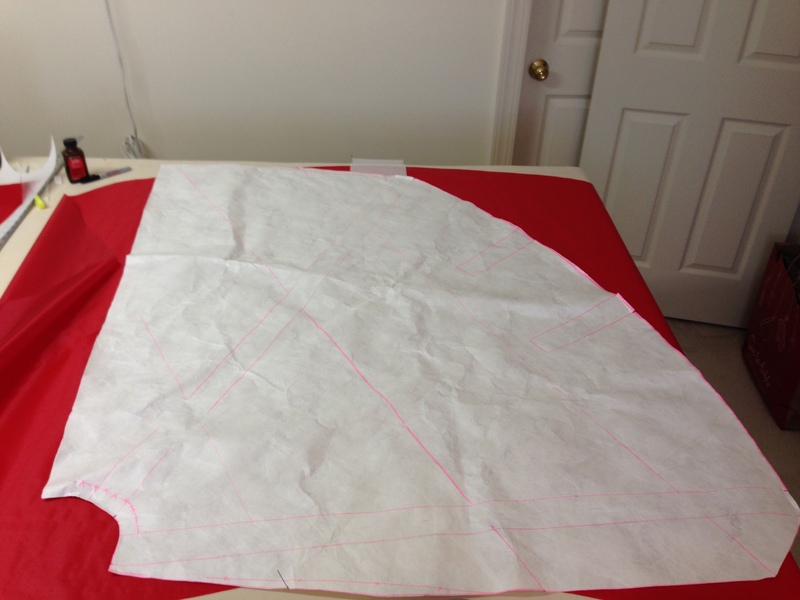 All this was stitched on very carefully, constantly making sure that the sail lined up. 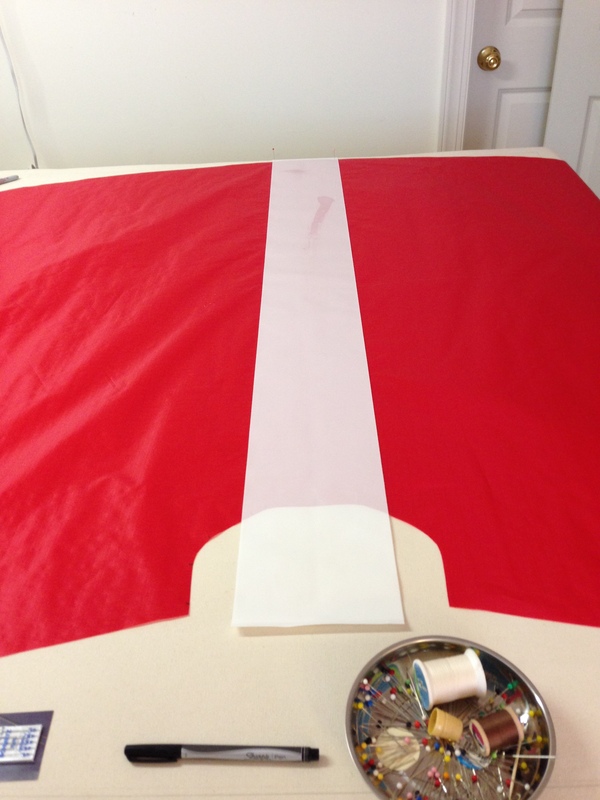 And finally we added two inch dacron edging on the outside of the sail. The semi-circles are for grommets, the ones on the batten so that I can luff the kayak sail to make a smaller sail, the ones on the boom to attach to the sheet. In the end the kayak sail turned out absolutely beautifully thanks to my wonderful aunt Margaret and her incredible skills! It took a bit of time but I am very excited to be taking it for a test run this weekend in Virginia Beach. 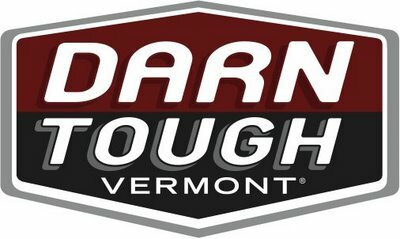 I’ll be posting pictures soon of it mounted on the kayak. Previous PostCockpit coverNext PostHomemade kayak sail completed! Impressive work. Love the sail. It truly is beautiful and looks extremely functional. Hey Colleen, thanks for checking out my site! And thanks for the compliment on the kayak sail. It’s working really well! Hey Grayson, love the sail! I’m currently working on a design for my own. 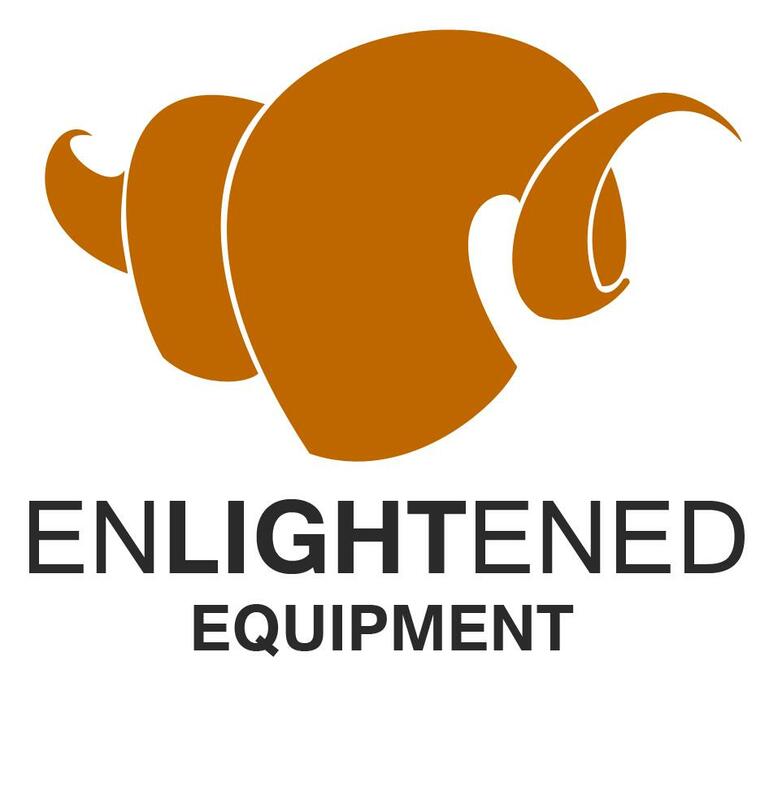 I’m a CAD designer at a manufacturing shop and am able to use all the equipment, so I’d like to make my own rather than purchase a $550+ sail. I was wondering if you’d share the dimensions of the mast and boom and how you came up with the sail shape? Hey Kurt, the sail is in storage right now for winter but if I get to it I’ll take a tape measure. I can’t believe I never posted the dimensions! I have no experience with sail construction so was just going off other dimensions and shapes I found online. It worked pretty well for downwind but I couldn’t keep the kayak from slipping with just a skeg and digging the keel in. It also luffs a little with anything less than perfect downwind on some sections so probably would’ve worked better with a near perfect triangle without the rounded edges but tough to say.